Im a holiday decorating fanatic. I love my holiday lights. This year I want to go all out, and I am going to light up the neighborhood - so to speak. I have devised a 32 light set project, that normally just blinks off and on, different colors different timers, etc. This year Im hoping to go completely arduino with it all. The most out puts I can control at one time seems to be 12. What is the best way to get a total of 32 outputs to go to 32 different areas of lighting sets I will need, controlled by one program? You can use any Arduino you like if you just use some shift registers, for example 74HC595. Uno/equivalent with 4 shift registers to sink current thru the lights. I have a board you can build up that will do it. Program the chip & drop in, or use USB/Serial adapter (FTDI Basic or equivalent) to download code into a bootloaded chip. are you serious, about the Mega - board having 54 different outputs? I thought that was 54-14 PMW pins - meaning only 40 to use? But are they also serious in that you can almost have an infinite amount of control over much more than that? And, is it easier just to stack 2 if like 10 more is needed, or is it easier modifying the software. Im not familiar with coding, so what might sound easy to some, will be almost impossible or far too time consuming to learn to do for others. thanks for all the help thus far. 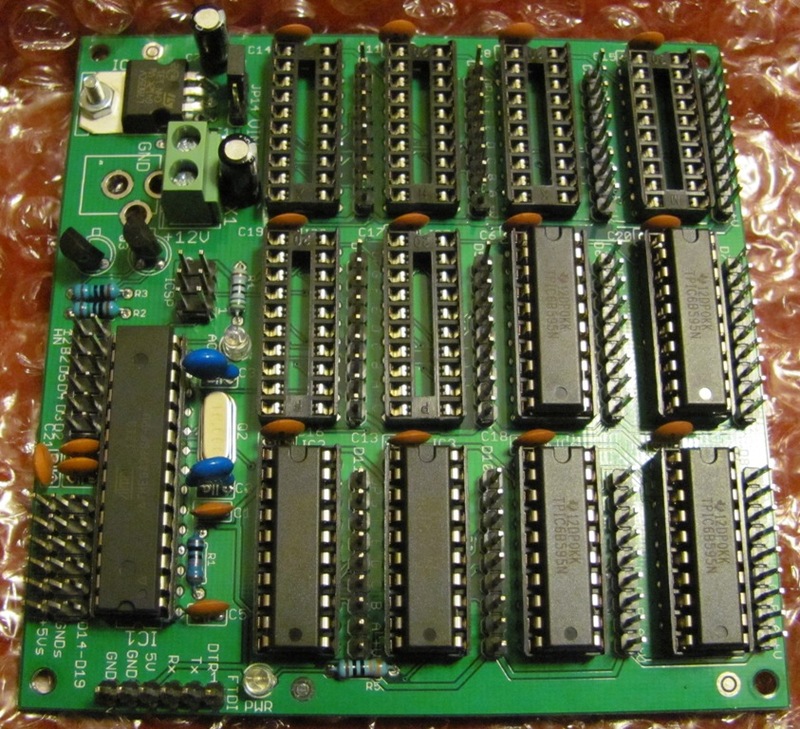 Yes, 54 I/O pins that can be used as digital input or output pins. Many pins have secondary uses such as PWM outputs needed for the analogWrite() command, other pins support serial communicatons, user interrupts, 16 of the pins support analogRead() commands, but bottom line is that all the I/O pins can be used as simple input or output pins supported by the digitalRead() and digitalWrite() commands, even the analog input pins. See above statement and ask again if that is not clear enough information about pin usage. Not sure about infinite and not sure what you are asking, rephrase maybe. Stack what? Arduino boards? no, you can have only one controller board but it can have shield board(s) stacked onto it. Shields can be added to do numerous things. Some shields use discrete IO pins, which then become unavailable to use by other shields. This is seem in motor shields a lot, where the cards all connect to the same PWM pins, so two cards of the same design can't be used. Some shields use shared pins; an example is the I2C bus. Every shield that uses I2C has to monitor the bus (data on SDA, clock on SCL) for its address and then reply as needed. Another shared bus is SPI. Here, the shared pins are clock (SCK), data out (MOSI, or Master Out Slave In), data in (MISO, Master In, Slave Out), and each device will have a unique Slave Select (SS) pin. If two shields are designed to use the same SS pin (D10, D4, seem pretty common) then there is a conflict. Other cards may use I2C to expand the number of IO pins, so writing to several registers on the shield provides additional input or output via shift registers, multiplexers, etc. Some folks, like myself, don't bother with shields, and just put the arduino functionality and the added IO into a new card. This one is an example. You can see the Arduino-like components at the left side - 5V regulator, ICSP header for a bootloader, L LED, the microcontroller and its crystal and caps, IO headers including +5/Gnd/IO pin for connecting potentiometers or other devices that might need power), Power LED, and on this board a couple of discrete transistors - and to the right a bank of up to 12 Open Drain Shift Registers (TPIC6B595) for 96 current sink outputs, good for controlling 7 segment displays, a plane of LEDs in a matrix, strings of LED strips, pretty much anything that needs 150mA of current to be controlled from up to a 50V source (LED strips for example need to control 20, 40, 60mA from a 12V source). USB/Serial is not built in because the design is not intended to be connected to a PC all the time. Instead, a header allows a USB/Serial adapter to be connected for downloading sketches. I've used this board in a number of projects, its turned out to quite handy.